The Mineral Resources Authority (MRA) through its Inspectorate Branch of the Regulatory Division has taken the initiative to promote Yoga within the mining industry. MRA says this initiative follows its concern of the health and wellbeing of mine workers in the country. It stated that this initiative is consistent with the fact that mining companies are mandated under the Mining (Safety) Act 1977 to, inter alia, ensure the ‘health and wellbeing’ of their employees which the Mines Inspectorate is obliged to administer and oversee. These legislative provisions also align with the PNG Vision 2050 and National Goals to achieve Integral Human Development. "To give effect to this initiative, the Inspectorate adopted September 22 as the "Mining Industry Day of Yoga." MRA stated that the Inaugural Mining Industry Day of Yoga was celebrated on September 22 this year where Mines Inspectors of MRA went to the various mine sites to engage with mine employees in Yoga sessions. Unfortunately, the concept of ‘holistic health’ is not much understood by most of the people and selective strategies therefore fall short of the desired outcomes. 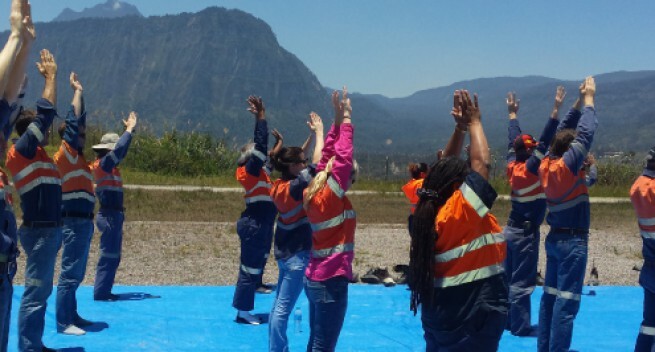 "We are confident that introduction of Yoga in the Mining Industry in particular and PNG in general, would prove to be the ‘game changer’ in achieving the PNG Vision 2050 and National Goals."